Nvidia’s 2019 Investor Day eased some of the concerns about long-term growth prospects and justified the optimism, but the deal to acquire Mellanox for $6.9 billion earlier in March started the 10-day bullish run. Analysts attending the event found renewed enthusiasm for the company’s future amid optimistic underlying growth drivers. Also, the management of Nvidia hit a home run by saying the end of Q1 2019 will sort late-2018 inventory headwinds caused by slowing cryptocurrency mining hardware demands. The global gaming market is growing, and analysts are anticipating it to reach $171.96 billion by 2025. Although Nvidia reports its revenue in a total of five segments, the gaming market makes up around 55% of its overall revenue. Globally, eSports has been emerging, and analysts are now considering it as a mainstream recreational activity. The increasingly diverse and complex needs of pro gamers will undoubtedly look for heavy-duty graphics processing units that Nvidia is well positioned to leverage in the coming years. Besides the vast gaming market size, Nvidia also has huge potential to capture a sizable chunk of the ever-growing data-center market and the proliferation of autonomous driving will only create more demand for hardware in the auto market. Together, these three sectors represent almost $100 billion worth of revenue stream. Nvidia has a good chance of claiming a sizable portion of this growth potential. The growing competition between large crypto mining pools as well as the increasing difficulty level of Bitcoin’s algorithm made mining the cryptocurrency less profitable for a lot of small miners last year. The lack of economies of scale and falling prices of Bitcoin and other outcomes made it impossible to turn a profit for a lot of small miners that severely affected the sale of mining gears. As miners shut down their operation, graphics card manufacturers suffered from slowing demand. Moreover, increasing inventory resulted in losses for not only Nvidia but affected its key competitors like AMD as well. The price of bitcoin is still lurking near the $4,000 level, and there is no sign of increasing demand for Nvidia’s products in the cryptocurrency mining market anytime soon. 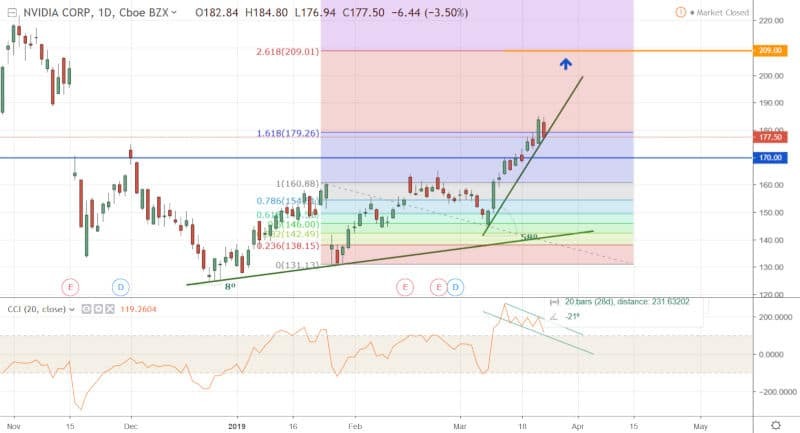 However, the indication given by its management on 2019 Investor Day that excess channel inventory is on track to clear in Q1 gave bulls ample reasons to bid up the price of Nvidia’s stocks over the past few days.